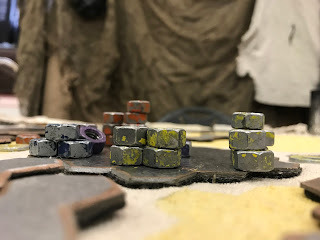 The real time strategy board game played in the post apocalyptic future. What is Fall of the Last City? 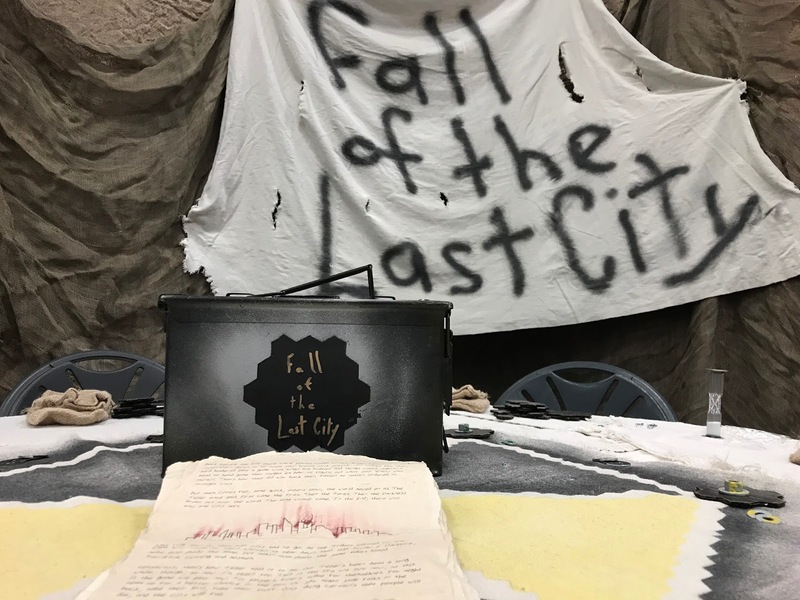 Fall of the Last City is an abstract real time strategy game played in the apocalyptic future. The people who play this game cobble together the pieces from scrap metal and salvaged nuts and bolts. It’s a harsh and unforgiving game that reflects the wasteland that gave it birth and the hard men and women that live the lessons it teaches. Everyone moves at once each round. This is a six player game where it is always your turn! The game board is dynamically built and destroyed every turn, every aspect of the game gives the player meaningful choices. Player interaction uses a challenge system based on the classic prisoner’s dilemma. The game can not be won through tactics or politics alone. I had a recent playtest while on vacation 'camping' in the woods of Pennsylvania. This is it! Day 115 and the 113th unique lense! It's taken more than half a year to work through the whole deck, but it was a journey worth taking. Does my design have a special feeling of life, or do parts of my design feel dead? What would make my design more alive? I think that Fall of the Last City feels very alive. I think that the simple mechanics and the emergent gameplay that they foster accomplish that well. The life of the game comes from the fact that the other five players are acting independently for their goals and the game will play out differently every time it is played. The difficulty curve of the game emerges from the skill of the players. As a group of players gains skill the gameplay becomes more difficult and nuanced. Which of Alexander's fifteen qualities does my design have? 1. Levels of Scale. We see levels of scale in “telescoping goals, ” where a player has to satisfy short-term goals to reach mid-term ones and to eventually reach long term goals. We see it in fractal interest curves. We also see it in nested game world structures. Spore is a symphony of levels of scale. Yes, this quality shows in the control of a base/control of a territory/control of the wasteland. In an alliance with one other player vs. the global network of all the alliances. 2. Strong Centers. We see this in visual layout, certainly, but also in our story structure. The avatar is at the center of our game universe — and generally we prefer strong avatars over weak ones. Also, we prefer strong centers when it comes to our purpose in the game — our goal. The bases provide strong centers as do the players pawns, and the City anchors the whole board. 3. Boundaries. Many games are primarily about boundaries! Certainly any game about territory is an exploration of boundaries. But rules are another kind of boundary, and a game with no rules is no game at all. Bases and paths have strong boundaries as do the territories. The six territories and the division of paths and bases provide this. 5. Positive Space. What Alexander means here is that the foreground and background elements both have beautiful, complementary shapes, like Yin and Yang. In a sense a well-balanced game has this quality — allowing multiple alternate strategies to have an interlocked beauty. The whole of the paths and bases vs. the empty space of the board and the filled and empty spaces within bases demonstrate this. The overall shape of the board in play and the shapes of the hexaheses provide this. 7. Local Symmetries. This is different from an overall symmetry, like a mirror image; instead referring to multiple small, internal symmetries in a design. Zelda: The Wind Waker has this feeling throughout its architecture — when you are within a room or area, it seems to have a symmetry, but it is connected to other places in a way that feels organic. Rule systems and game balance can have this property as well. The paths and bases under the control of each of the players embody this. 8. Deep Interlock and Ambiguity. This is when two things are so tightly intertwined that they define each other — if you took one away, the other wouldn’t be itself any longer. We see this in many board games, such as Go. The position of the pieces on the board is only meaningful relative to the opponent’s pieces. You can see this in the choices of the prisoner's dilemma and in the territory control mechanics. 9. Contrast. In games we have many kinds of contrast. The contrast between opponents, between what is controllable and what is not, and between reward and punishment. When opposites in our game are strongly contrasted, the game feels more meaningful and more powerful. The consequences of allying vs betraying or having a base well defended enough to discourage attack vs having enough guards with you to force your expansion are examples of this. 10. Gradients. This refers to qualities that change gradually. The gradually increasing challenge curve is an example of this, but so are appropriately designed probability curves. The increase in a player's power and in the bases they control and in their array of alliances show this, as does the increase in mobility as they lay down paths. 11. Roughness. When a game is too perfect, it has no character. The handmade feeling of “ house rules ”often makes a game seem more alive. This is shown in the visual design of the game and in the presentation of the rules. Also in the inter player conflict. 12. Echoes. Echoes are a kind of pleasing, unifying repetition. When the boss monster has something in common with his minions, we are experiencing echoes. Good interest curves have this property, especially fractal ones. You see this in the taking of citizens from the city, the placement of them in bases, the removal of them from enemy bases, the loss of them in challenges and the counting of them for the control of the city. 13. The Void. As Alexander says, “In the most profound centers which have perfect wholeness, there is at the heart a void which is like water, infinite in depth, surrounded by and contrasted with the clutter of the stuff and fabric all around it. ” Think of a church, or the human heart. When boss monsters tend to be in large, hollow spaces, we are experiencing the void. The emptiness of the wasteland at the beginning of the game and the emptyness of the city before it's fall show this. 14. Simplicity and Inner Calm. Designers talk endlessly about how important it is for a game to be simple — usually with a small number of rules that have emergent properties. Of course, these rules must be well-balanced, which gives them the inner calm that Alexander describes. 15. Not-Separateness. This refers to something being well-connected to its surroundings — as if it was part of them. Each rule of our game should have this property, but so should every element of our game. If everything in our game has this quality, a certain wholeness results that makes the game feel very alive indeed. 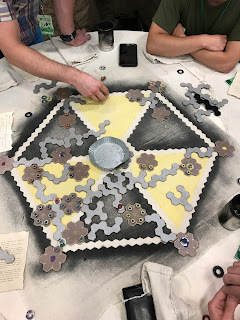 I think the level at which all of the elements of my game from the rules to the esthetics to the emergent dynamics are the thing about the game that I am most proud. Could it have more of them, somehow? I could always use some more inner calm, and I will try to keep all of these qualities in mind as I make changes to the game going forward. Where does my design feel like myself? I think that the contradictions in the game are the things that are most like me. It's a game about taking control of a wasteland with violence... but in the end it calls that goal into question effectively enough that many players choose not to win. Wait... It's day 114 and you said there were 113 lenses! What kind of shenanigans are going on in this place?!? Ok, so there are 113 lenses. But when I started down this road I was using the physical deck of them to draw from. Later I switched to the app. Somehow I screwed it up and ended up repeating a couple of lenses. No one noticed because there are 113 of the little guys and some of them look quite similar. In any case I am almost done, but I will end up with 115 lens posts once I track down all the duplicates and make sure I have answered all of the lenses at least once! With respect to each other the player characters all have the same status... except that one person has taken the role of the person who found the game and is teaching it to the other players. So their wasteland game player character will have higher status. The role that character is playing in the game will be the same as all of the other players though. In terms of NPC's the Teller has high status as he/she is the narrator. The players are all playing tribal leaders so they have the highest status in their tribes. With tribal warriors below them. In the larger world the tribes are below the citizens of the City. In a previous version of the game there were NPC tokens for the 'City Heads' who would have the most status in the game world, until the end of the game anyway. While all of the players are the 'same' status and are all working together to take down the City, they all know only one person will win so they are vye for power and status throughout the game. At the same time they need to know the rules and will listen to the player who is teaching the game. Conflicts of status are interesting - how are my characters vying for status? Throughout the game the players are trying to win, but being in a winning position involves acting against the other players. So players damage their social status with the other players by advancing their game goals in one sense. On the other hand being in the winning position and winning the game confer status in the normal way so players must balance that internal conflict. How am I giving the player a chance to express status? The status of players is important every time they enter into a challenge rather than just as a end game result. So having the mechanical advantage throughout the game has ongoing social consequences that affect the game outcome as much as the tactical aspects of the game. Ideally, what would I like players to do? Explore, come into conflict, ally and betray, claim victory or not and then think about what they have done. Can constraints get players to do it? I think that they of course help. The rules of the game are designed to shape that play pattern. You must place pieces to move onto. You must place bases to recruit from, you can challenge players when you are next to them. The high player number gives many chances to ally. Can goals get players to do it? The goals you have for points mean you need the territory and resources that other players have. In the end the rule that gives you an explicit choice about winning causes the players to reflect on the game in a way that I want. I was unsure if that would work but so far I have gotten positive feedback. Can interface get players to do it? I think that the layout of the game encourages the kind of play that I want. Presenting the player with the pieces they can place encourages exploration. Showing the position and progress of other players encourages securing your territory and defending it, or attacking your opponents weakly held territory. Showing the alliance tokens openly encourages players that have not allied to do so. Can visual design get players to do it? The game's thematic presentation as a game played in an apocalyptic wasteland helps put players in the ruthless aggressive mindset that I am looking for while distancing them from the real world so that they don't take the actions of other players as seriously as they might if they were playing as themselves... that is only true to the degree that players take on roles. Can game characters get players to do it? Well the Teller is literally telling them to behave that way so hopefully that works! Beyond that I hope that my plans to have back story created for the tribes (clans?) will help the players to identify with them and both increase investment and make the actions of other players seem less personal. Those two goals are in conflict and I am not sure to what degree it is possible to pursue both. Can music get players to do it? Perhaps. Many board games have provided soundtracks and I have thought of having a stretch goal of creating music for each of the tribes, the game and the climax... that is a huge cost though since I can't do it myself. I may recommend playlists for the game and I could try playtesting it with them and see if it enhanced the game. Is there some other method I can use to coerce players towards ideal behavior without impinging on their feeling of freedom? I think that in my case I use the story premise of the game, that it is a reenactment of a event that happened. To justify the rule based goals of the game and give players one more reason to act out the scenario that I have designed to be the most fun. "I thought this was going to be Civilization but it's StreetFighter!" "I can’t believe all that happened in one game!" Metahex Studio - Chris Barney. Picture Window theme. Powered by Blogger.